(A) Assume that Australia begins to recover from its recession. Using a CLG (correctly labelled graph) of aggregate demand and aggregate supply for New Zealand, show the impact of Australia's rising income on each of the following in the short-run. 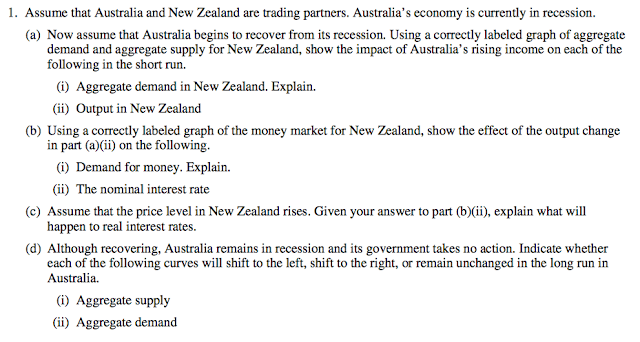 (i) Aggregate demand in New Zealand, Explain. 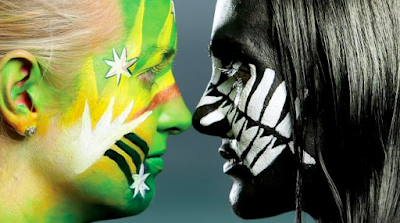 Ok, so if Australia's citizens are recovering from a recession they are buying more New Zealand goods. New Zealand's exports are increasing. Aggregate demand must be increasing and therefore output must also be increasing. 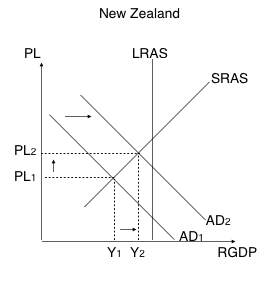 (B) Using a correctly labeled graph of the money market for New Zealand, show the effects of the output change in part (a)(ii) on the following. (i) Demand for Money. Explain. Understand - As incomes increase (Y1 to Y2) the demand for money increases. Why? If output is increasing it means that the PL is increasing, if the price level is increasing then the demand for money is increasing. If the demand for money is increasing the demand for loanable funds is increasing, therefore the NIR (nominal interest rate) is increasing. From the Fiscal Policy Cheat Sheet, Here. You want more? OK. As the economy improves (output/GDP increases) then people are being hired back to work. Prices are rising as more and more people have the incomes to buy the goods they want pushing the prices ever higher. The citizens need more cash on hand for daily purchases as the prices rise (demand for loanable funds increases). This means that they are either taking the money out of the bank as prices rise (supply of loanable funds decreases. Either way the Real Interest Rate is going to increase. If the real rate is increasing the nominal rate is also increasing. The Real Rate is the opportunity cost of borrowing money (price of money borrowed) or the purchasing value of the money when borrowed. The nominal rate is the opportunity cost of holding money or the change in the value due to inflation. Check out the Real vs Nominal blogpost here. (C) Assume that the price level in New Zealand rises. 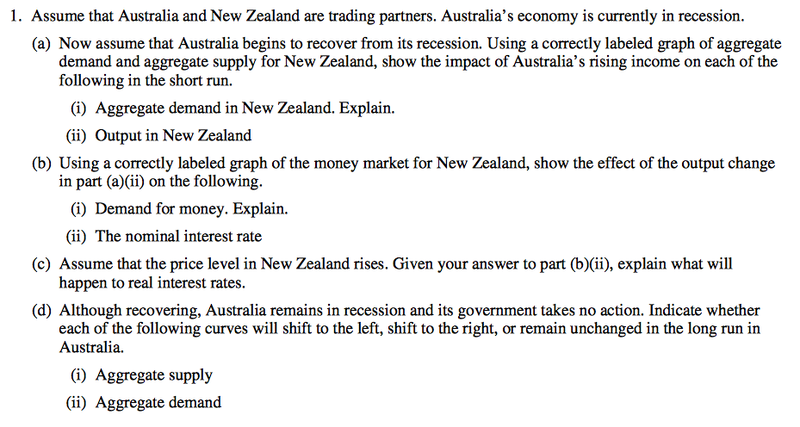 Given your answer to part (b)(ii), explain what will happen to Real interest rates. IF, the nominal rate is rising the real rate is rising. Inflation causes the Real rate to fall but if the nominal rate is rising faster than inflation then the real rate is still increasing, but if inflation is rising faster that the nominal the real rate is falling. Remember the Unemployment/Inflation/Phillips curve cheat sheet Here. 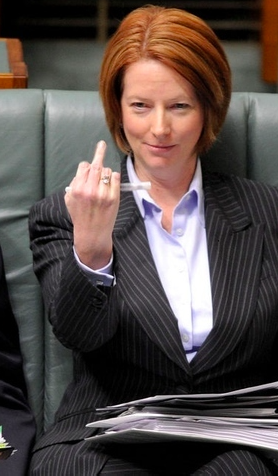 (D) Although recovering, Australia remains in recession and its government takes no action. 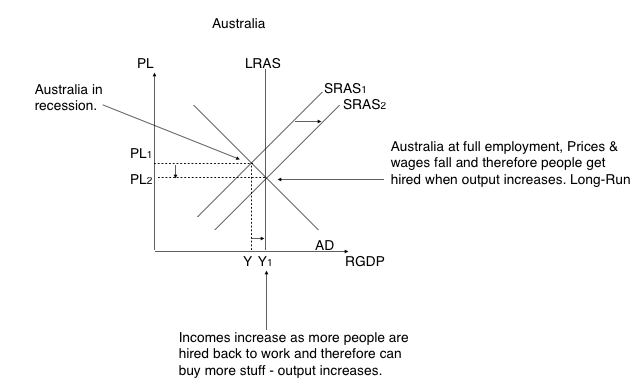 Indicate wether each of the following curves will shift, left, right or no change in the long run in Australia. Recession, government takes no action, what shifts in the long-run. SRAS shifts rightward. AD no change.